A Luau in Maui! Our Maui HI Vacation Wouldn't be Complete Without it! We think a luau in Maui is a MUST-DO activity on your Maui HI vacation. At a Maui luau, you'll get traditional Hawaiian cuisine, exciting entertainment, tropical Hawaiian scenery and a Mai Tai (or two... or more...!) Plus, the best luaus in Maui even have cultural displays and demonstrations to entertain their guests prior to the show! What more could you ask for? I know many of you might be unsure if a luau in Maui is for you... But trust me, going to one of the Maui luaus could very well be one of the best parts of your entire Maui HI vacation! So why would you want to go to one of the Maui luaus? For starters, WHY NOT?!? You're in Hawaii after all! Going to a luau in Maui is just one of those quintessential Hawaiian experiences that makes your Maui HI vacation feel like you're really in Hawaii! Without a luau, you could be in ANY tropical vacation spot! Besides... it's not like you'll ever get to experience a luau at home, right? If you're like me, you had to travel so very far for your Maui HI vacation, that if you miss out on a Maui luau this time around, it may be a LONG time before you are able to come back and get a second chance! If you set aside just one evening on your vacation for a luau in Maui, I think you'll be glad you did. Prior to going to a one for the first time, I assumed that a luau was primarily for seniors... don't ask me why... I just did! Well, I was wrong! My husband and I were pleased to see that they are truly for all ages! We saw couples in their 20's and 30's, parents with their children, the middle aged, and, yes, seniors too! We've learned that a luau can be enjoyed no matter what age you are! The entertainment has been good at every single luau I've ever been to... granted, some have been better than others, but I can honestly say I've enjoyed every single one! 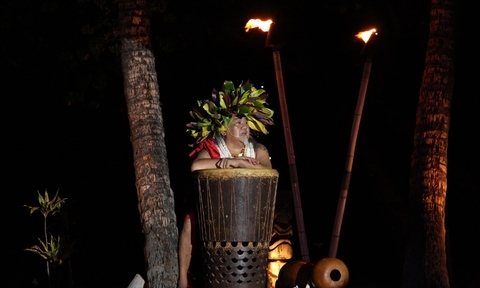 You'll see hula dancing, listen to Hawaiian music, and you may even see fire dancers! As for the food, you'll tend to hear mixed reviews. But, I think it depends on what you're expecting. If you're looking for casual food that's like the cooking of the Hawaiian grandmother that you never had, then you'll be MORE than satisfied at pretty much any of the luaus. If you're expecting a fancy schmancy type of meal, you can get that too, IF you go to the Feast at Lele. The Feast at Lele is definitely a "best luau in Maui," and gets rave reviews for not only its top notch entertainment, but its 5-course gourmet meal that is served to you at your very own private table! There is NO other luau on the island that does THAT! And I must not forget to mention the Mai Tai's! This is the one drink that you are pretty much GUARANTEED to find at every luau in Maui. Don't get me wrong, most luaus offer other alternatives, but if I were you, I'd make sure you treat yourself to a Mai Tai at least once! Sipping on a Mai Tai always reminds me of being in Hawaii. The sad thing is, once I get back home, if I try to order a Mai Tai at any of the local places, they normally have no idea what I'm talking about! I guess I'll either have to learn the recipe, or go back to Maui! What can I say? I've become a HUGE fan of luaus, and even though I've already been to a few, I can guarantee that on my next Maui HI vacation, I'll be going to one of the Maui luaus... or maybe more than one! Click here to see our Maui Luau listings and help on choosing the perfect luau for your Maui HI vacation!